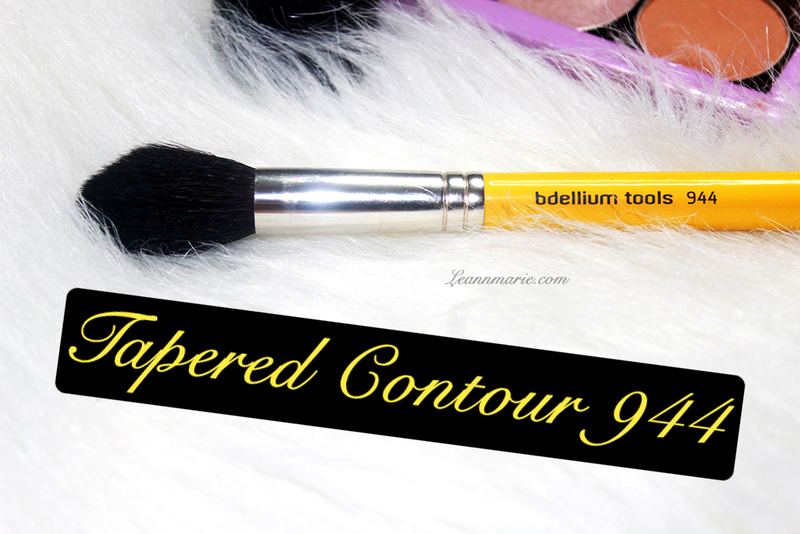 Today I'm going to share with you three brushes from Bdellium Tools that I was really impressed with. 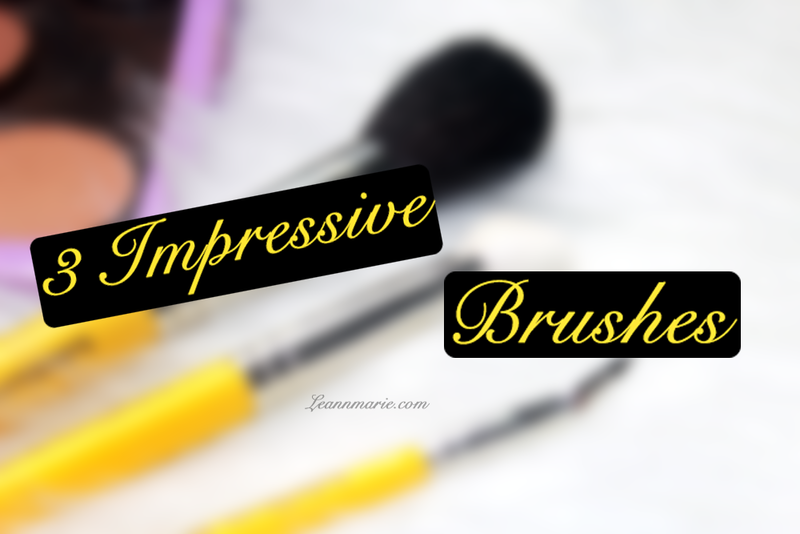 First off, I really loved these brushes and they have become some of my staple brushes when it comes to doing my makeup. Of course when they are clean to use. However, they are becoming some of my favorites to use. Especially the tapered contouring. I can say however, that I did get a bit of shedding with the 788 and 944 brushes. When I first started using. I'll get more in depth on each brush. Again, I love the color and the feel of the handle in my hand. It is good for my small hands and easy to grip well or soft. If you don't already know: My name is Leann, and I'm an eyeliner addict. Yes. I love my eyeliner. Very much so. Eyeliner was the FIRST makeup product I really got to wear and experiment with. I've grown to love it over the years and I don't know where I'd be without it. 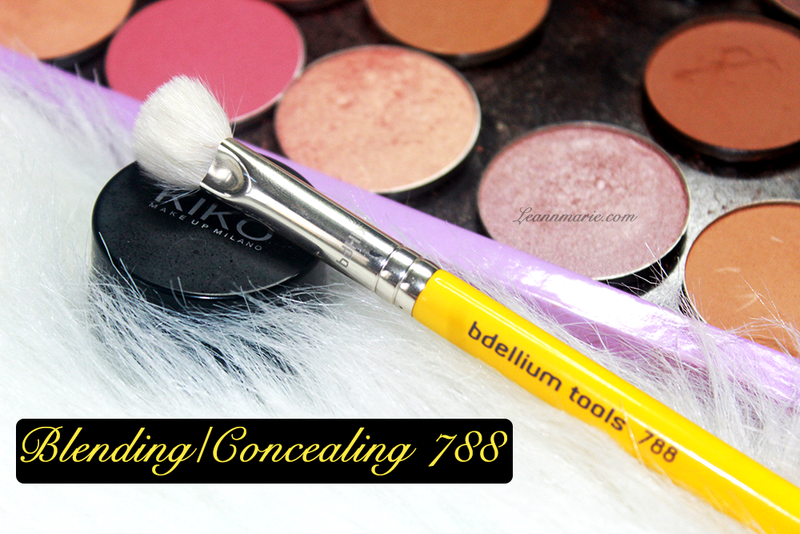 So I was very excited that Bdellium Tools sent over one of these brushes for me to try. I've always been hesistant to try. Because I'm a little intimidated about the bent part of the brush. 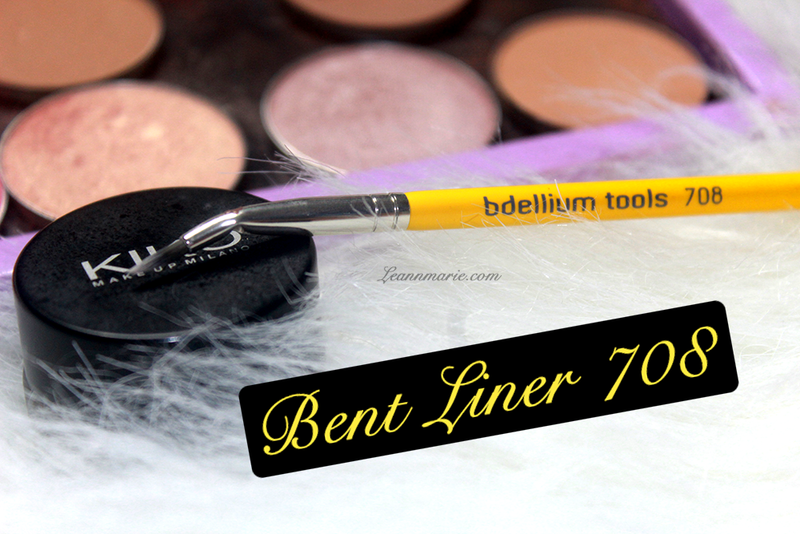 The last bent liner I tried was from Lancome and I didn't like it too much. It was nice and all but the tip was too loose and not well for me to control (being a beginner). Now that I'm an eyeliner masteer ;).. I had a little more confident when handling this brush. To start off I absolutely love the shape of the actual bristles. It points! It points! It points! Oh what a joy you can ask for when you're getting a brush like this because it is defintely different than doing your eyeliner with an angled brush. 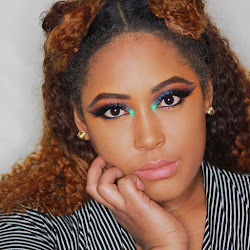 For me, this was personally one of my favs because the pointed end was defined enough for me to get a great tip on my eyeliner without having to clean up much. Ah I know the pain having to touch up your liner, but this glory brush saved that. I'm still debatable on the bent part of it. The thing that I didn't like about the brush was that although it was defined and pointy, it wasn'tthat this. So you aren't able to manuever the brush on all sides if you catch my drift. It's good for detailed and thin wings, but for someone who loves thick liner, I had struggled a bit with it. Okay.. Okay. Do you want to pros or the cons first? Since I went the other way before, I'm going to start with the cons. This poor baby shed on me like a dog. At first when I just got it and I was feeling the bristles and the shapes, I noticed that a few hairs were coming out and a bit out of place. No big deal though. I was still going to try this bad boy. I loved the shaped and the design of this brush. Manly because it's like a mini angled contour brush for your eyes. When I first used it, it did shed on me a bit when using it and when I first got it. But it's held up pretty good since. I also didn't like how I was able to shape it back that well after washing, but it still came out pretty fine after drying up. Oh oh. But don't get me wrong, I love this brush. What I think is great about this brush, is that I like using it two different ways. The first way is to get the higher more dense part of the brush to apply my transition shades. That way the color comes out more defined and you can easily blend it out without it being too washed out. If that's okay with you. I prefer it since my transition shades tend to be on the warmer and neutral side. Then I like flipping the brush to it's original position, so that you're getting the soft bristles to seemsly blend everything out. It's a brush I love to go for when I want to pack my transition shade on and get a nice background. Oh mother of contouring, was I looking for a brush like this. Having an oval shaped head, but with smaller sized cheeks, it's hard to find a brush that properly defines my face without being too much and taking up the whole side of my face. Not to mention I like to have a more natural contour and nothing too heavy, so this is the perfect brush. I can easily get the hollows of my cheeks and if I want, I can build up the intensity in multiple swipes or just one. It's also great for seemsly blending out the edges so that aren't too heavy as well. It picks up product very well and applies well too. I did have a little shedding with this brush but not as much as the other brush. 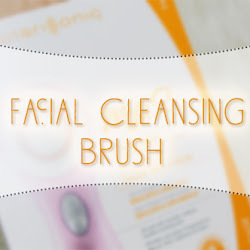 What do you think about these brushes? Which ones would you try? Leave me a comment below and make sure to check out all of Bdelliumtools social media! 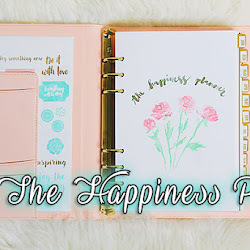 I'm back with a new post! 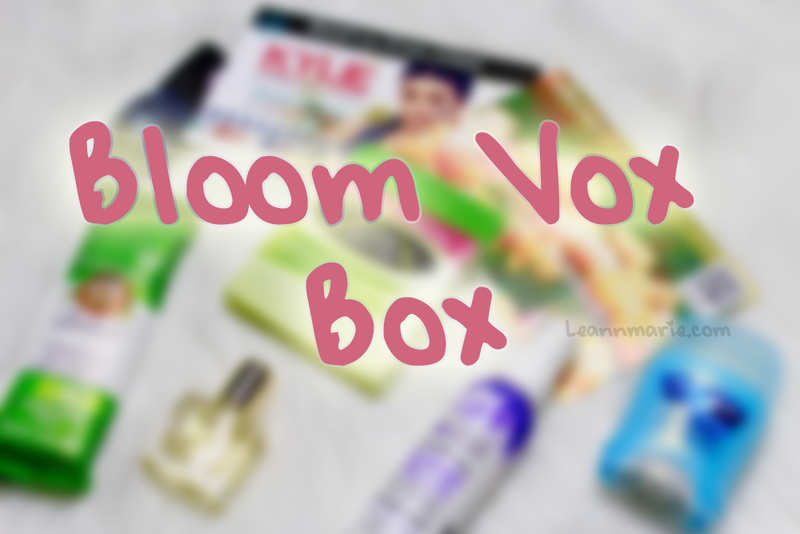 Today I'm going to be sharing with you, my Bloom Vox Box from Influenster. I hope you enjoy this post. Make sure to leave a comment down below telling me what product you would want to try! 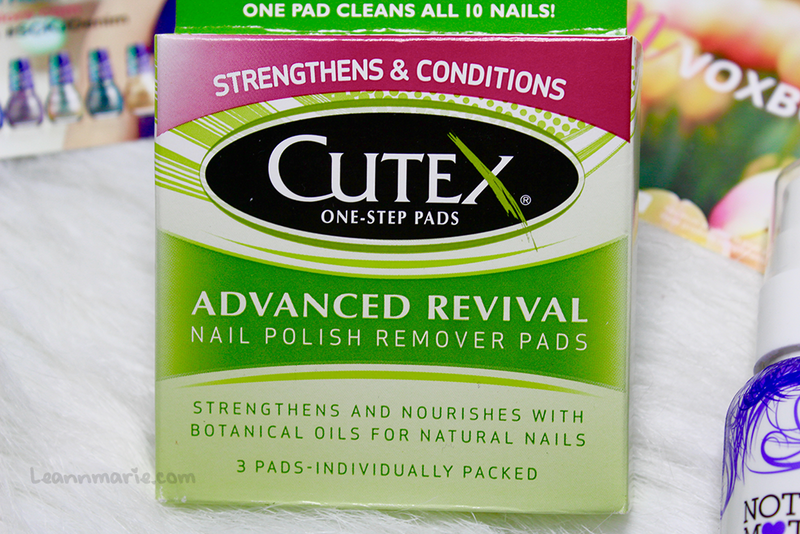 These Cutex nail polish remover pads, claim to take off all 10 fingers or toes of nail polish with one swipe. They also claim to strengthen and condition your nails as well. These are perfect on the go nail polish removers because you don't need anything but the wipe to take your nail polish off! You can really use one wipe to take even dark colors, like a deep olive, off your nails. And when they say that they are soothing to use as well... They weren't lying! This has to be the best formula of nail polish remover I ever used. When using it, it doesn't dry out your cuticles or the skin around your nails. It is very conditioning to the nail and to the skin as well. I highly recommend! 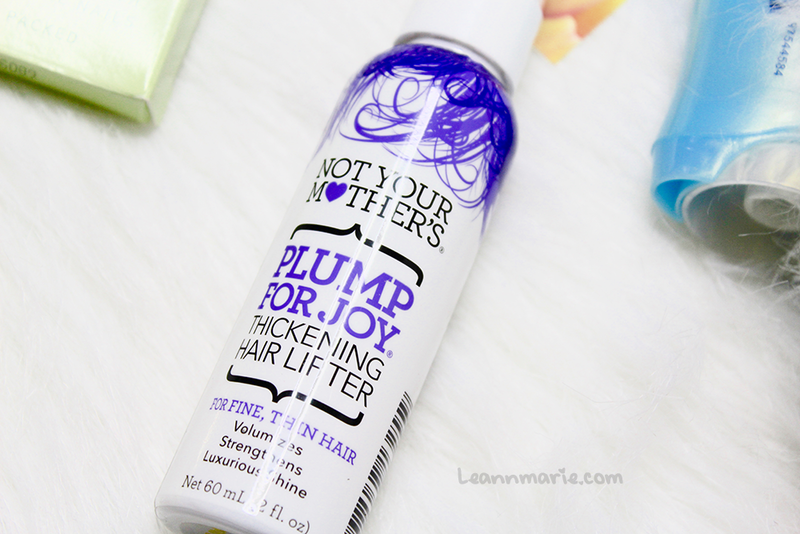 The Not Your Mother thickening spray claims to make thin hair, very voluminous as well! Me personally, I already have pretty thick hair with a lot of volume. However, the front of my hair doesn't get as much volume as the back does, so I decided to put this to the test! At first I was like, this isn't going to do anything to my hair. I mean, I already messed it up by applying it the wrong way. I just sprayed it in my roots and shook it out. The directions say the best way is to spray it into your hands and then you can put it in your hair. They want you to put it all throughout your hair but I didn't want to have a big afro at the end of the day! Okay, so I applied it and waited a while and by a half an hour later... my hair was on 100! I'm talking big Diana Ross style hair okay. It was nice but not for me, haha. This product certainly does do what it says! and it lasted into the night time, I'm talking like 11PM. So I do recommend this product for thin haired people. My oh my oh my. 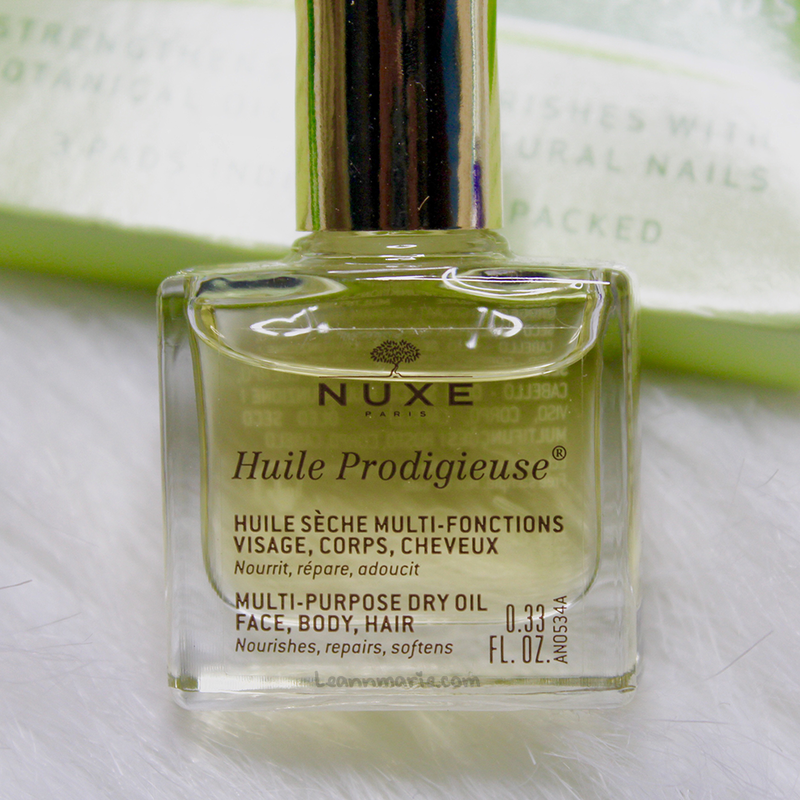 What can I say about this NUXE multi-purpose dry oil other than I love it! I love this so much. When I put this on my skin after my shower, I just wanted to roll around on my faux fur rug. My skin felt oh so baby smooth and I had a sweet scent lingering off my body. I definitely felt like a rich businesswoman with wonderful, yet expensive taste in her hygiene routine. I wish the sample size was a little bigger, but that's just me being greedy. Ah, if you want to splurge on an oil, please make it this one. You're gonna love it, especially if you love a sweet floral scent. Nothing too strong to overpower, but enough to pack a punch. This was definitely my favorite thing in the Vox box. I LOVED this granola bar. Yes I did. I couldn't even film an unboxing video because I ate this as soon as I finished taking the picture. I was that excited to try it and it was really that good. The oats were beautifully cooked but still nice and moist and the honey added a perfect texture without being too sweet. It was the perfect little snack that you can enjoy on your down time. And what's perfect about this, is that it's preservative free! How awesome. 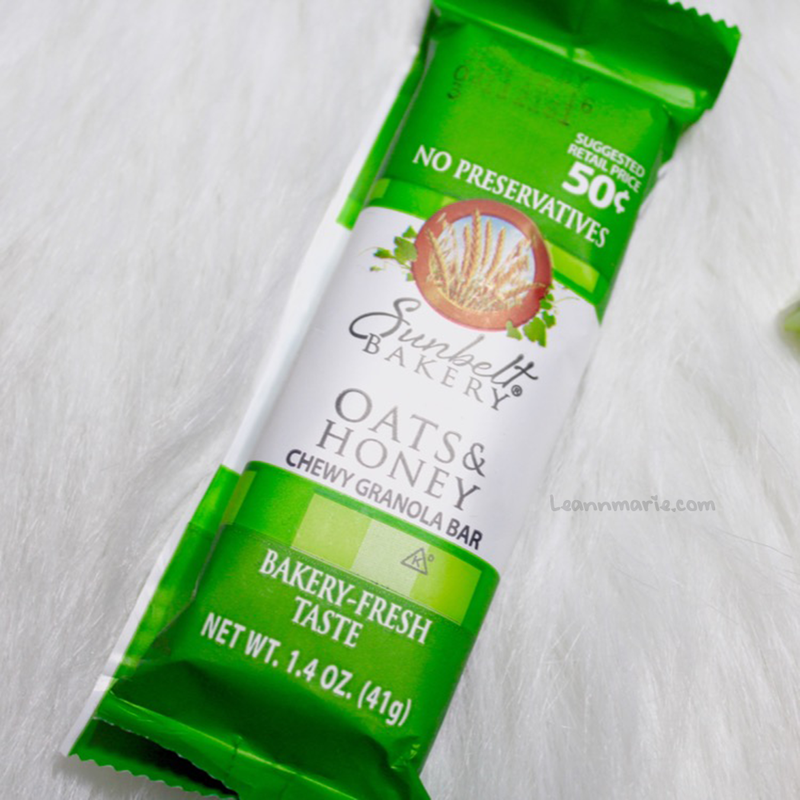 You definitely have to try this granola bar! This Secret deodorant claims to last 48 hours. I don't know if it's just me or my body, but Secret deodorant doesn't really work well for me in general. I used to use it before, but then it just stopped working for me so I really lean more towards Dove. This would be great for someone who does like Secret already. It has a sweet scent to it and applies smoothly. It just didn't last that long for me and it was easy to wash off. 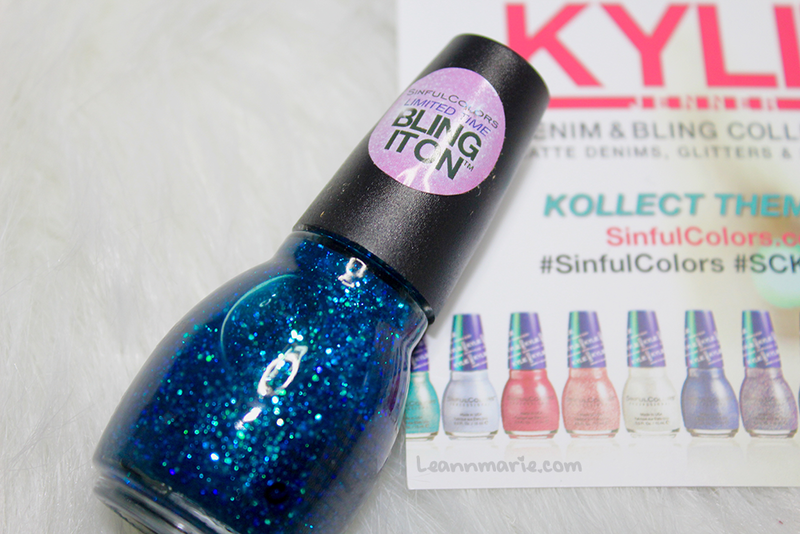 The last product I got was one of Kylie's nail polishes from Sinful Colors. I got the shade Teal Midnight. It is a nice teal but almost deep blue shade with beautiful hints of shimmering glitter. This did take about two or three coats to really bring out the color, but that's okay. The only thing is, that even with a top coat, the polish did chip a little easy. However, I am excited to see and try the many different shades! Her collection includes: creams, glitters, shimmers, mattes,speciality textures, and brights! She also has a Denim Bling collection that has 20 matte denims and holographic glitters, also shimmers! You can these at your local Walgreens. Be sure to check it out! 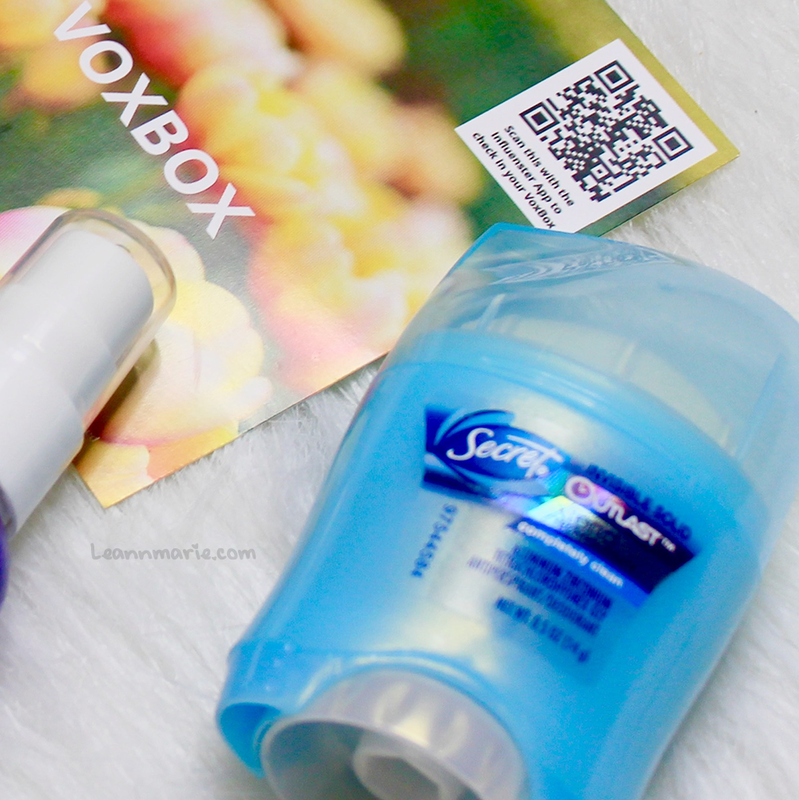 Overall, I loved this Vox Box so much. 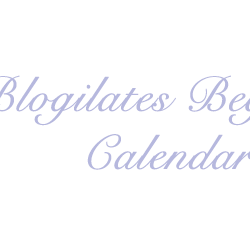 Now after reading about all the products, which one are you most excited to try? Leave a comment down below and I'll talk to you soon! I received these products for testing purposes.